Mythology is the scientific and historical study of myths belonging to any people. The work in hand is a dictionary of mythological references in Guru Granth Sahib, the Sikh Scripture. This Scripture is a great mediaeval anthology of the hymns of the Sikh Gurus and the like-minded radical saints who flourished in India from the twelfth to seventeenth century. Though the poets belonged to different parts of the country and different groups of society, they had a common religious ideology, therefore though they repeated the same thoughts in their poetical compositions, they presented images drawn from their own visible and intellectual spheres. The diversity of imagery derived from nature as well as indoor life, makes the poetry appealing and ever fresh. Some times the image is created by the use of myth. The saint-poets and the Sikh Gurus have made use of mythology, not as an article of belief. The use of mythology be them is just illustrative of their background. This book elaborates all these mythological references in an effective manner and narrates their background in an interesting way. Dr. Surindar Singh Kohli, was professors and head of the department of Punjabi, Panjab University, Chandigarh. He has not only made a significant contribution in the field of comparative literature, but has also done a distinct service in the realm of comparative religion in general and Sikh Studies in particular, through his works including, The Sikh Philosophy, Yoga of the Sikhs, Outlines of Sikh Thought, Philosophy of Guru Nanak, Travels of Guru Nanak, Sikh Ethics, The Sword and the Spirit and the Conceptual Dictionary of Guru Granth Sahib. He is an authority on Sikh scriptures and has made their thorough and critical study in a dispassionate and scholarly manner. His works are marked by clarity, brevity and profound scholarship. The study of myth is of great importance in the study of individual societies and human culture. The myths of a people reflect and explore the image of that people. Generally speaking, a myth is a kind of communication, but in religion it is the symbolic narration. Such a narrative is believed to be substantially true by the people, among whom it is current. The myth does not induce discussion or argument it is only a presentation. It is said to be one of the three forms of religious expression viz., sacred speech, sacred acts and sacred places. Sacred speech pertains to sacred texts and hymns, sacred acts connote the cult rituals and sacred places (or objects) are symbols. The three forms always occur together in any culture. Myth and history differ from each other in their style of narration. Whereas myth is a narrative of origins, history is a narrative of recent events. The myths are traditional. They go back to an age, which is called 'mythopoeic age', but there are some myths, like the legends the of the saints or the founders of religions which have arisen in historic times. In the latter case, the story coincides with contemporary spirit. Mythology is the scientific and historical study of myths belonging to any people. The work in hand in a dictionary of mythological references in Guru Granth Sahib the Sikh Scripture. This Scripture is a great mediaeval anthology of the hymns of the Sikh Gurus and the twelfth to seventeenth century. It is the product of Bhakti Movement. During this movement five Bhakti cults were prevalent in India viz., Vaishnavism, Shaivism, Shaktaism, Shauryaism and Ganapatyaism. These cults considered Vishnu, Shiva, Shakti, Sun and Ganesha as manifestations of God respectively. Alongwith these cults of Hinduism, the Muslim mystics called Sufis, were also making their contribution towards Bhakti Movement. In the Punjab, Where the Sikh Scripture was compiled and edited. Vaishnavism, Shaivism and Shaktaism were the representative Hindu cults and the Chishti and Qadiri orders mainly represented the Sufis. Guru Granth Sahib the Sikh Scripture, is a huge volume, consisting of 1430 pages, having the songs of love and peace, written in various Indian languages and dialects. Except JAPU of Guru Nanak Dev in the beginning and Swayyas and shlokas at the end, all the other compositions are set in thirty-one Ragas and Raginis. All the poems in the Scripture, smaller ones or longer ones, follow a definite metrical system. Though the poets belonged to different parts of the country and different groups of society, they had a common religious ideology, therefore though they repeated the same thoughts in their poetical compositions, they presented images drawn from their own visible and intellectual spheres. The diversity of imagery derived from nature as well as indoor life, makes the poetry appealing and ever-fresh. Sometimes the image is created by the use of myth. The saint-poets and the Sikh Gurus have made use of mythology, not as an article of belief, but just to explain some practice or belief. The use of mythology by them is just illustrative of their background. The contribution of fifth Guru, Guru Arjan Dev, is the largest in the Sikh Scripture. After him, we have Guru Nanak Dev (the first Guru), Guru Amar Das (The Third Guru), Guru Ram Das (the fourth Guru), Kabir (the saint of Uttar Pradesh), Farid (the Sufi Saint of Punjab), Namdev (the saint of Maharashtra), Ravidas (the saint of Uttar Pradesh) etc. The contributors were all types of men: Jaidev was a Brahman, Pipa was a king, Namdev was a calico-printer, Trilochan was a Vaish, Sadhna-a butcher, Dhanna-a farmer, Sain-a barber, Kabir-a weaver, Ravidas-a cobbler and the Sikh Gurus-Kshatriyas. The people to whom the sacred lyrics of the Scripture were addressed on before whom they were sung, were mainly Hindus, whose heritage consisted of Shruti and Smriti. The four Vedas were their Shruti; each of them was divided into four parts viz., mantras, Brahmanas, Aranyaks and Upanishads. The Smritis were the Itihasas and Puranas. Itihasa (Epics) consisted of Ramayana and Mahabharata. The Puranas (eighteen Mahapuranas and eighteen Upapuranas) were mainly Vaishnavite, Shaivite and Shaktaite. These works were the basic sources of the Hindu traditions and store houses of their myths. Mr. P. Thomas, the author of Epics, Myths and Legends of India has rightly remarked: "Hindu mythology is more than mythology. It is living religion. Throughout India can be seen idols of gods and goddesses worshipped at present as was done hundreds of years ago. Most of them are true to type and could have easily stepped out of one of the Puranas," He writes further, "The study of the Vedas was the exclusive privilege of the Brahmins. For the common folk, the Smritis were considered good enough. They learnt stanzas of them by heart or listened to recitations by priests. Even now Katha (story-telling) is a regular religious institutions, and Brahmins learned in sacred lore can be seen reading passages from the Puranas or Epics to enraptured audiences and explaining to them the meaning of myths and legends. While the lower classes are generally ignorant of the teachings of the Vedas and the philosophic schools, practically every Hindu is conversant with the tales of Rama and Sita, of the doings of Hanuman, of the adventures of the Mahabharata heroes and of the various activities of Krishna. Inspite of the effort of the Arya Samajists, the Hindu revivalists, to bring the Vedas to the masses, the religion of the vast majority of Hindus still remains Puranic, that is mythological." The Sikh Gurus and the radical saints arose from the common Hindu Folk and were thus saturated with their tradition but they had a distinct message to convey to them, as staunch protagonists of the Bhakti Movement. They believed in only one God, who is both Transcendent and Immanent. Therefore they rejected all other gods and goddesses. Any being, who takes birth, passes away, when it completes its span of life. (Asa M. 5, P. 375). Why should that god or goddess be worshipped, who takes birth and passes away? (Var Gujri M. 3, p. 509). Since mythology explains and illustrates the nature and character of the gods or other powers, the attitude of the Sikh Scripture towards the gods or their legends becomes evident. It does not form part of the belief of the contributors of the Scriptures. The masses used various names for their gods, which were actually based on their exploits and feat or those of their incarnations. But the same Names were sanctified still further by appending them with Ultimate Reality, because it is He only, under Whose Command every act was performed. When the Creator-God is brought into focus, He is unison with Preceptor and True disciple. He is the Purity-incarnate, while the gods, goddesses and other powers engulfed by maya are all impure. They are mere chessmen in the world's play. The rituals performed to appease the gods have thus no worth in the eyes of the Gurus and saints. 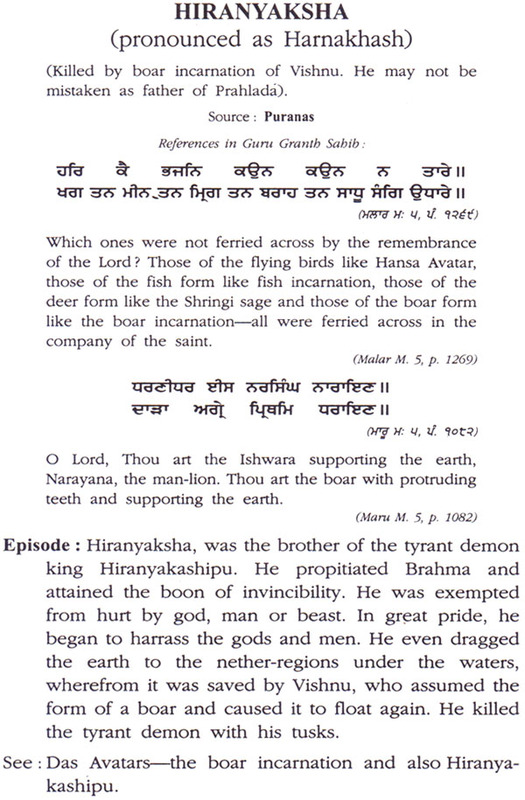 The mythological references used in the hymns of the Sikh Scripture are used to substantiate a point. Through such references the point is fully illustrated and elucidate. Two instances are quoted below, one from the hymns of Guru Nanak Dev and the other from the hymns of the saint Namdev. The foolish and thoughtless Ravana was led astray, He was beheaded and Lanka was plundered; the pride hath a fall without the love of the True Guru. 5. Jarasandh and Kalajamun were killed, Raktabij and Kalanemu were destroyed; after destroying the Daityas, the saints were saved. 7. Without the Guru, the pride cannot be eradicated, By the instruction of the Guru, piety, patience and the Name of Hari are obtained; Whosoever gets the Name, he sings the Praises of the Lord, saith Nanak.  12. The Smritis, Vedas and Puranas, all such books cry out, that Everything is false without the Name of the Lord, all talk is futile. Thus the Sikh Scripture talks about the above-mentioned Hindu scriptures with regard to the Name of the Lord, while their myths are merely old stories. Though the Muslims were a dominant force, when the Sikh Scripture was prepared, there is very little Muslim Mythology incorporated in its verses. Some references to Islamic concepts and beliefs are found in the verses of the Sikh Gurus, Kabir and the Sufi saint Sheikh Farid. This work has been prepared at the request of some serious students of the Sikh Scripture, because in various hymns, they find some mythological references and they cannot proceed further unless they understand fully the import of such references. In order to explain each reference, it was thought necessary to give the source of the references, examples of its use in Guru Granth Sahib along with the required episode or comment. I am confident that this work will serve the purpose of giving desired information. I hope it will be useful to both the ordinary readers and the scholars of the Sikh Scripture.